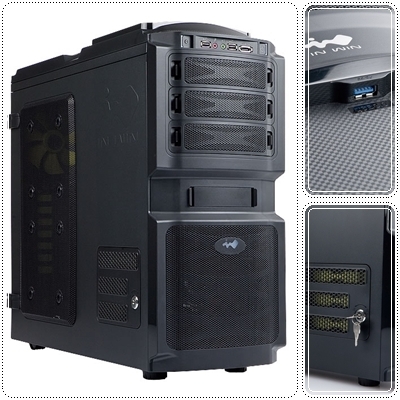 In-Win Development Inc., has today launched its new performance PC chassis, the BUC. The "shield" concept behind the BUC's design is echoed across its front panel, while the strong SECC steel construction and a hard-wearing black interior and exterior create a reliable, subtle and high quality case for PC builders. The BUC's design gem is the clever EZ-swap HDD drive bay, with a lockable door that allows access to three HDD without having to remove the whole side panel. The tool-less, vibration reducing drive bays complete the package to give a triple innovation. With convenient Super-speed USB 3.0, USB 2.0, audio and eSATA ports on the top of the chassis, users can easily connect headsets, cameras, cell phones, external hard drives and a wealth of other devices with ease. Microsoft Windows 8 release date in mid 2012 ? How AMD Bulldozer Turbo CORE technology work ?